Presented in a large and economic pack size, our Gompels Professional Dishwasher Rinse Aid has been manufactured for high-traffic kitchens. Stored in a durable plastic container with a large handle and screw down lid, it has been designed for use in dishwashers with automatic dosing systems. When added to the final rinse stage, it helps to ensure the rapid drying of all items while also offering a streak-free finish. 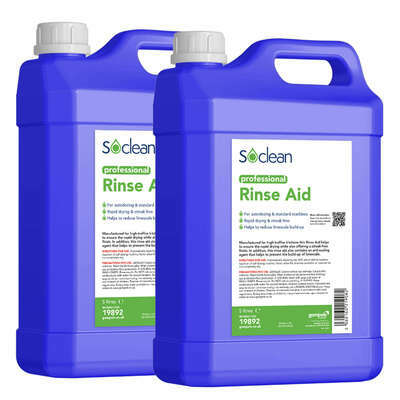 In addition, this rinse aid also contains an anti-scaling agent that helps to prevent the build-up of limescale. Helps to encourage rapid drying and reduce the build-up of limescale. We have a wide range of products on hand to support your washing up regime. From our Professional Machine Dishwash through to our 7 in 1 Dishwasher Tablets in lemon, you'll find the perfect item for you at an exceptional wholesale price.